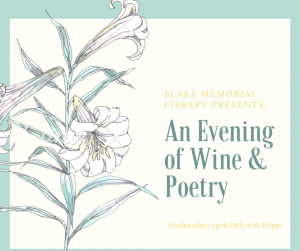 Join us on Wednesday, April 24th at 6:30pm at Blake Memorial Library for an inspirational poetry circle to celebrate National Poetry Month. 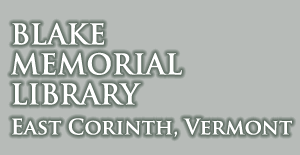 Please bring your favorite poem or something you’ve written yourself to share with the group. We will provide some light refreshments, you may bring a bottle of wine, and we will eat, sip, and share while listening to and discussing the beautiful verses.